Zack Snyder’s grand vision for the DCEU may have had a wobbly second installment, but I would have liked to have seen where it was going. After all, how bad could a film about Darkseid invading Earth and the Justice League struggling to prevent it from becoming another Apokalips really be? Sadly, these movies will only ever be seen in our imaginations, with the only glimpses of what Snyder might have accomplished relegated to his regular updates on social network Vero. His latest post shows off Batman on what I presume is the set of Justice League, (but may well also be Batman V Superman: Dawn of Justice). Shrouded in mist, he looks like a Frank Miller panel come to life, which is precisely the visual style Snyder was aiming for. Interestingly though, that’s not Ben Affleck in the Batsuit. Rather, it’s his stuntman Richard Centrone, who’s worked with Snyder on multiple projects over the years. 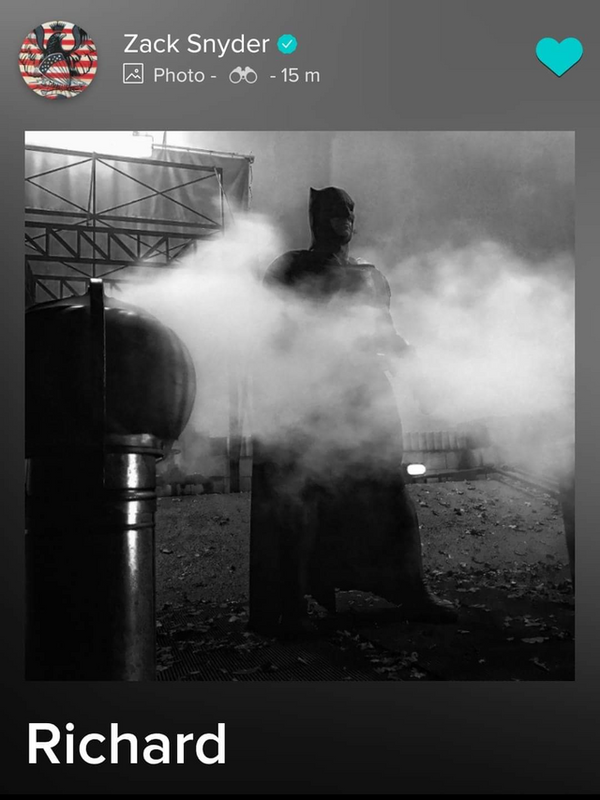 While a photograph of the Dark Knight standing on a rooftop doesn’t easily indicate where in the film this might be, fans seem to think it was taken from Snyder’s original scene introducing the character in Justice League. In the Joss Whedon cut, we see him tangling with a Parademon. That scene re-used this set, though at present, we don’t have a very clear picture of what the original sequence was. Who knows, though, maybe someday in the future, the mist surrounding Snyder’s original cut of Justice League will clear and we’ll get a look at what the film might have been? I get that the chances of this are minimal, and probably reliant on a clear-out of executives at Warner Bros. and someone sympathetic to Snyder who’s willing to put up the money to see his vision of Justice League on home video release. Still, stranger things have happened. After all, the Donner cut of Superman II didn’t see the light of day until 26 years after the Richard Lester theatrical release.